I had to write as soon as we were back to let you know what an amazing time we just had. It was probably the most wonderful experience we have had as a family. Everyone loved every minute. The whole trip exceeded even our best expectations and created memories for us and the children that will last a lifetime. Buzz and Hugh were both absolutely fantastic, as guides, chefs, and cocktail mixers!! Thank you so much to everyone for creating just the most spectacular 4 days. 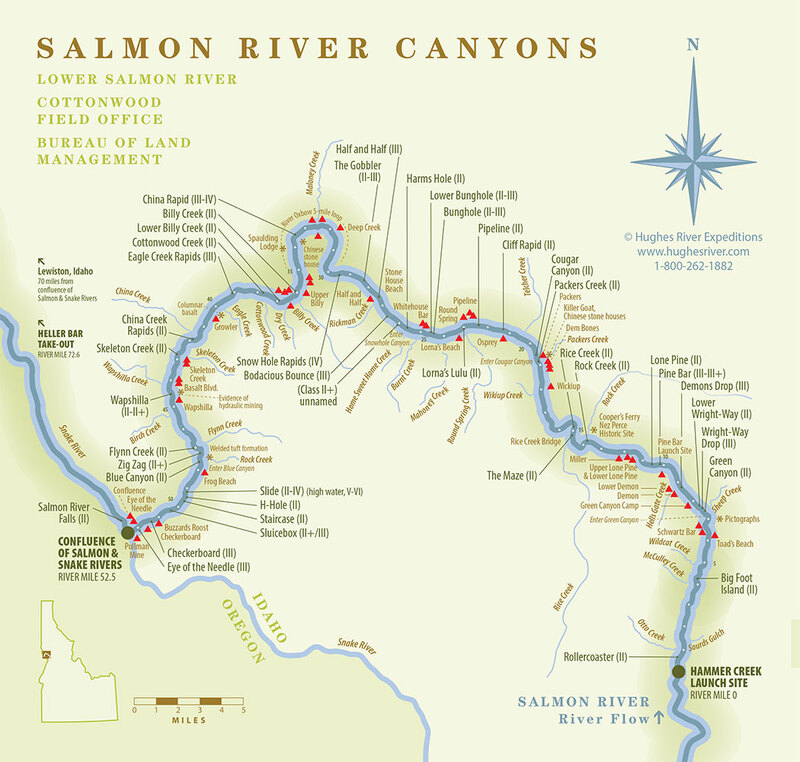 We love the Salmon and it’s wonderful beaches, rapids and stunning views and will be back one day to try out the Middle Fork. The food was delicious…. Expect lots of enquiries from London as we will be definitely recommending Hughes River to all our friends!! I want to express my sincere appreciation to you and your crew at Hughes River Expeditions for a first-class trip down the Salmon River last week…. (It) left me with a strong desire to trade in the tie and computer for a kayak and oar! Thanks again for a great river trip. You impressed a group of people who aren’t easy to impress! I’m looking forward to my next trip. Hope to see you soon. 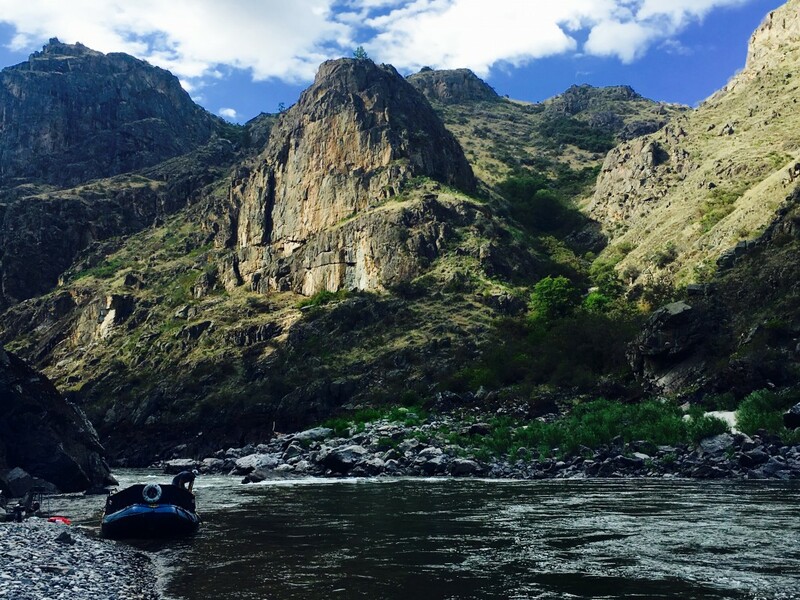 Our Salmon River Canyon float trip … was a huge success. All of your guides were extremely professional as well as being good company. As usual, the food and care taken of us was excellent. 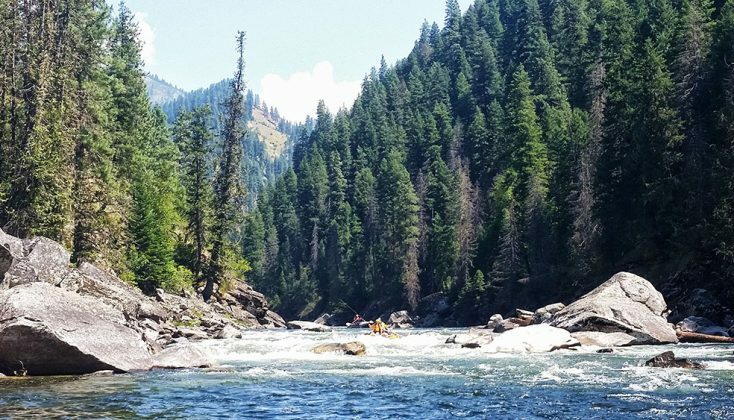 It was also nice that two of your crew guided us on the Middle Fork a few years ago – it was like adding two old friends to the group. We look forward to our next one. 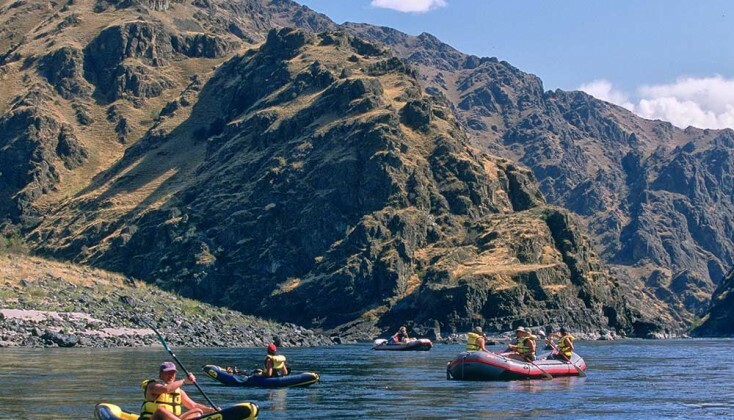 Our trip with you on the Salmon River Canyon was outstanding… Thank you for all your efforts. We hope to do it again. We will send others. 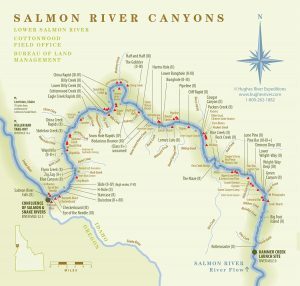 Our family just returned from the July 20-23 Salmon River Canyon trip. This was our first experience camping and whitewater rafting. I needed not to be apprehensive for our safety. Your guides were knowledgeable, strong, and experienced… The trip was fun, exciting, and beautiful. Thank you for providing such a quality experience. Just wanted you to know what an excellent time we had on the Salmon River Canyon last week. My expectations were so high based on our prior trips with Hughes and it was hard for me to believe that those expectations could be exceeded – but they were. Great trip, great weather, Buzz, Traves, and Mark were absolutely outstanding. Couldn’t have asked for anything more. You’ve outdone yourselves again. THANKS!! You guys probably get this kind of mail all the time, but WHAT A GREAT TRIP!!! I particularly appreciate you steering us to the Salmon Canyon, as it was ideal for our group. The whitewater was daunting enough to challenge the boys and provided them with a positive first experience in kayaking. Loved the sand beaches and the great campsites. We thoroughly enjoyed the guides. All of them were cordial, entertaining, and very patient with the younger children. The food was outstanding, but you knew that. Even Andy the World’s Pickiest Eater went back for seconds on salmon. The boys worked so very hard to make our river experience a truly memorable one! !…I didn’t feel we were able to give them a proper good-bye! This being my only regret of a near-perfect trip; you have a great group working for you and we can’t wait to join you again soon. Just wanted to thank you and your crew for another incredible experience on the river. Everyone was unfailingly lovely and every detail was perfect (right down to the live music during cocktails!!! Many thanks. Sandy and I want you to know that we had a wonderful time floating the Salmon River Canyon recently. …. (O)ur guides played a huge role in making our experience one to remember. They were professional, friendly, highly-skilled, and fit into our group as if they were close friends. …It seemed like everyone on our float trip was hand-picked. You can be certain we will replay this experience many times and share it with others. Thanks again for all the wonderful food, local expertise, and a couple of well-deserved dunkings. It was wonderful hangin’ out with all of you! I’d love to run the Middle Fork with you sometime in the future. You all ROCK!!!! I want to thank you for the trip you put together for our group in July. We had a great time…Ashley, Fred, Ryan, Eric, and Hugh Cooke are all great and took very good care of us. With the four 7-9 year olds, Ashley sort of got turned into a childcare boat and the recreational manager, along with her other responsibilities, and the kids all loved her. 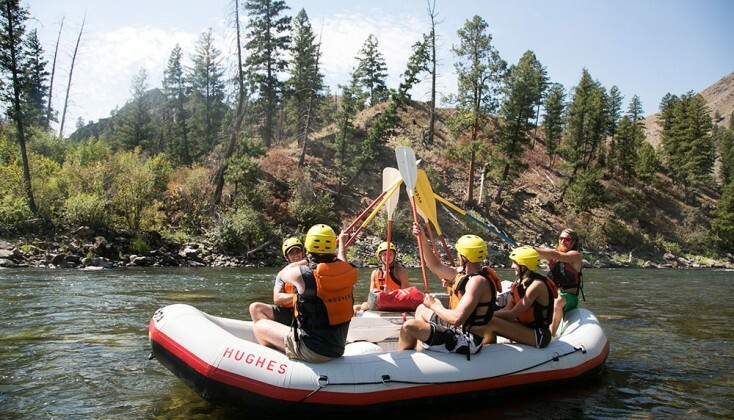 Each time we do a rafting trip your people make it a memorable event and please pass along our thanks. I’d like to thank you and your great crew for a wonderful rafting trip. It was the perfect celebration for our 50th anniversary and we were very fortunate to get all of our children and grandchildren together for the trip. ..The trip was a great adventure and it seemed to have something for all ages of our family from 5 to 76. Your rafting team did a wonderful job of guiding us through the rapids as well as taking care of our every need over the five day trip… Please also express our sincere appreciation to your crew for a job well done. The guides were amazing, they tended to every need, every questions, Skip took great care of the fishermen, he never ran out of stories, Devon handled the kayakers with grace and skill,… she and Mike were so cool, Hugh was ever the gentle man, always able to tell stories about the canyon, Tony of course was always watching over everyone to be sure things went well and safe, Mike was so awesome, Jon can sure play the harmonica… and of course Marshall, he kept everyone laughing… Every meal was done to perfections, … Camps were perfect… Every guide made sure each of us were taken care of and we felt appreciated. I just can’t tell you enough how awesome this trip was, everyone in our group was amazed at the organization. We will be back again for sure. We have just returned home from a wonderful trip on the Salmon River…We have been on more than a dozen professionally guided river rafting and kayaking trips.. (and) our recently completed trip with Hughes River Expeditions stands out as one of the finest adventures we have experienced… The crew’s team work and seamless sharing of the endless duties and chores was so efficient that it made the hard work appear easy and even fun. It certainly met and exceeded all our expectations…. Please pass our appreciation and thankfulness on to each of the crew members. I just wanted to thank you for such an AMAZING experience on the river last week. I have never done anything like that before, and I had the BEST time! I will never forget this trip, you and your crew and the amazing experienced you all created for me and my co-workers. I can’t wait to bring my family and friends along for a trip soon! Well, we are back home in our “normal” routines again after a wonderful sun and fun filled rafting trip. What a well-run, oiled machine you have created. Our crew – Hugh, Robbie, John and Kaine were TERRIFIC!! So courteous, efficient, and just all around nice guys. They have been trained well – but you can’t teach some of the caring qualities they possess… They made the trip fun and interesting as well with their knowledge of the area and the rivers. Of course,… the band was superb! What an experience! Top notch jazz in the wilderness! I wanted to let you know what an incredible trip we had. The landscape was amazing, the food was delicious, and the rapids were super fun. But absolutely and by far the thing that made this trip super special for me were the guides. From keeping us safe, to keeping us fed, to keeping us entertained, they went above and beyond. … They were also incredibly wonderful with our kids, encouraging them to try out the kayaks and showing them the ropes…. I wanted to take them all home with us after the trip.